As we all know about Mi 2nd anniversary game and their offers, new launches, 1Rs flash sale. If you haven’t read anything about this we recommend you to read this article. We are offering auto-buy for their flash sale products. This sale will take place on 20-22nd July in the afternoon 2pm. 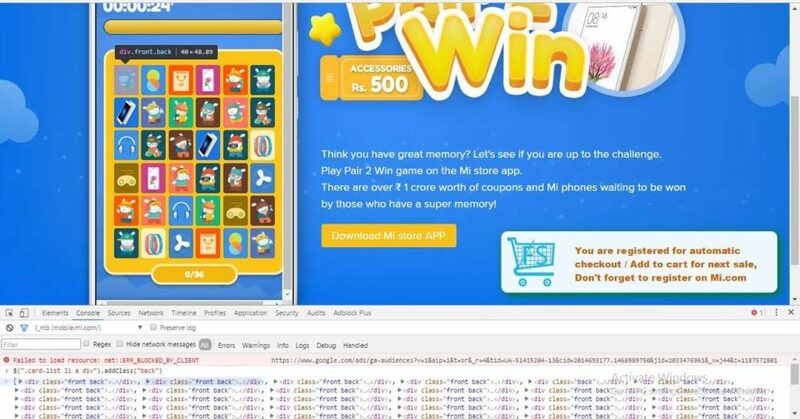 Mi is giving away 30 mobiles and 300 product at just 1Rs. 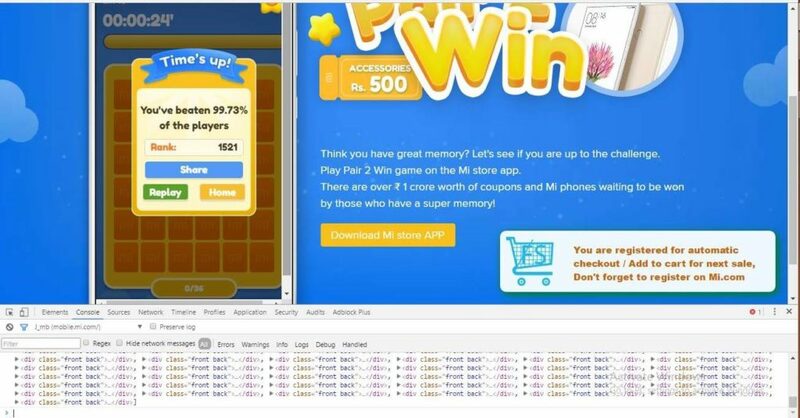 Visit Mi.com game by clicking here and start the game. Right click on any card and click on inspect. All the decks are showing in the other way, with this you can easily match the pairs and win the game. This trick works on any desktop browser. You can easily complete every task and win prizes worth 5000. Here is the video proof of Mi 2nd Anniversary Game trick..
Hey Abhi I won the 50Rs voucher after that I haven’t played much. But upto my knowledge no one won more than 50Rs voucher. shravan , by completing what level did u win 500 voucher? Hi Bhargav, We updated our extension for todays sale. Now it will work on any time zone. Just follow those steps with high speed internet. Our extension will automatically add the product to cart. We have updated the trick. NOw you can just copy paste the code. and please let us know if it worked or not. Yeah Even i got nothing but 50 Rs Voucher. Hey we are really sorry but this can only work on desktop browser. Hello Neha, everything is clearly mentioned in the article step by step or you can also watch the video for better understanding. For a brief info click on any deck to open inspect element then add the code(which was given in the article) this will show you every card on the other side. not working now.. please check and confirm tried on chrome and firefox.. as per the instruction provided. Hi Abhi, Watch the video carefully and follow the given steps. It is working for everyone as you can see previous comments everyone got succeeded. Please try once again it will surely work. Hi Ujjval, the trick is working for everyone. Please follow every step and watch the video for further reference. what about auto buy script for 1rs sale? Hi Ujjval, download our extension and check your entry on the icon. This will allow you to get flash sale products. For more details visit flash sale article. how do i do it on app? Sorry Rishab we couldn’t find any source to create this script in app. Try on your desktop browser. Sorry and thanks for this amazing trick. they have stopped the desktop version of the game.Now we can play it only on the app.What to do?? Is their any other trick for it as well.